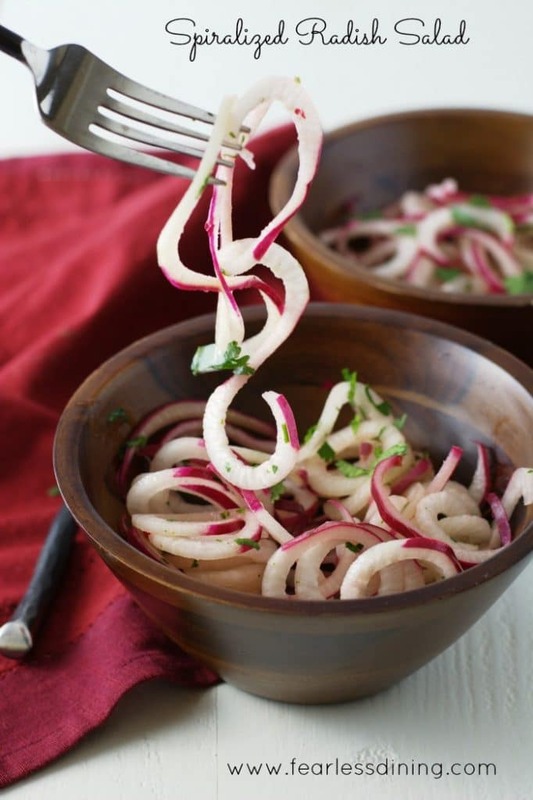 This healthy spiralized radish salad is a fun side salad that packs a flavorful punch. It took a little bit to get used to it. At first I had a few fails. Now that I know the right width for vegetables, I have been able to create all sorts of fun things. I found these unusual long purplish red radishes at our farmer’s market last week. Something new and unusual! Have you seen these around you? I am laughing at my self….I really thought it was a purplish red carrot when I saw it. There was no sign, and I am glad I asked. Can you imagine buying a big bunch of these spicy radishes, only to find they aren’t the sweet carrot you had hoped for? My kids’ first bite would have been amusing. Unfortunately, I didn’t see this variety on wikipedia, so I can’t tell you what it is….but I will say it spiralizes beautifully!! I am thinking it is related to a daikon radish. Have you seen this before? Easy radish salad with lime and cilantro. 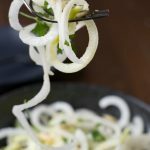 Use a spiralizer to spiralize the radishes. In a small bowl, add all liquid ingredients. Pour over the radishes to blend. 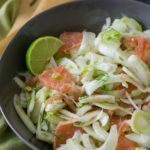 This salad tastes even better if it sits with the lime juice for 15-20 minutes before serving. These look exciting and good! This is absolutely gorgeous! I must try this. Radishes are always a big hit in our home. This looks so fresh and delicious. I actually have that same spiralizer and it works so well. Now I HAVE to find those radishes. This looks so crunchy and fresh! Can’t wait to try! I have never seen a radish like that before, but not I want to find one! 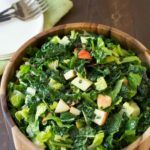 Radishes are my husbands absolute favorite veggie, so I know he’d devour this salad. Beautiful! This looks like the perfect healthy snack! Can’t wait to try it! I hope you like it Jamie. That radish is crazy looking LOVE IT!! I love my spiralizer too, and it is my mission to find a radish like that to use it! Yum! I wish I knew what the radish was called LOL.